Le Mars, Iowa, March 1, 2012 /PRNewswire/ — After tasting, refining, and more tasting, Blue Bunny® will unveil new ice cream treats in March 2012! Made with care in the Ice Cream Capital of the World, these new treats showcase the finest flavors and the best options for enjoying ice cream. 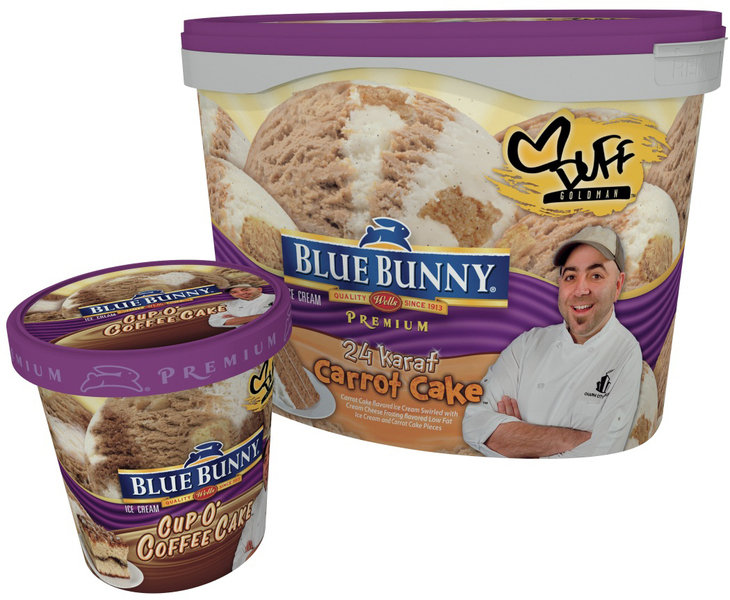 From Sweet Freedom® to decadent flavor blends inspired by Chef Duff Goldman, experience these newest ice cream delights from Blue Bunny®. Blue Bunny® is the first national brand to offer an extensive selection of no sugar added ice cream options. It’s not just the no sugar added, all Sweet Freedom® treats have 150 calories or less, eight grams of fat or less, and 30 grams of carbs or less. 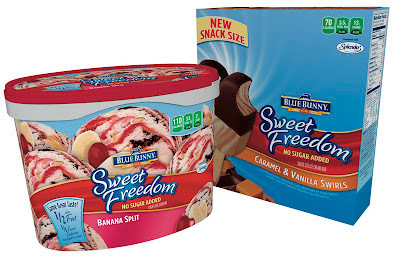 With new cones, snack size treats, ice cream flavors and a fudge bar and ice cream flavors, Sweet Freedom® offers indulgent treats for every taste. These decadent new flavors with less sugar, carbs and calories are the Sweet Freedom® Snack Size Ice Cream Bars in Raspberry & Vanilla, Caramel & Vanilla, and Chocolate & Vanilla, the Sweet Freedom® Fudge Bar, the Sweet Freedom® Vanilla Ice Cream Cones and 10 flavors of Sweet Freedom® Ice Cream. 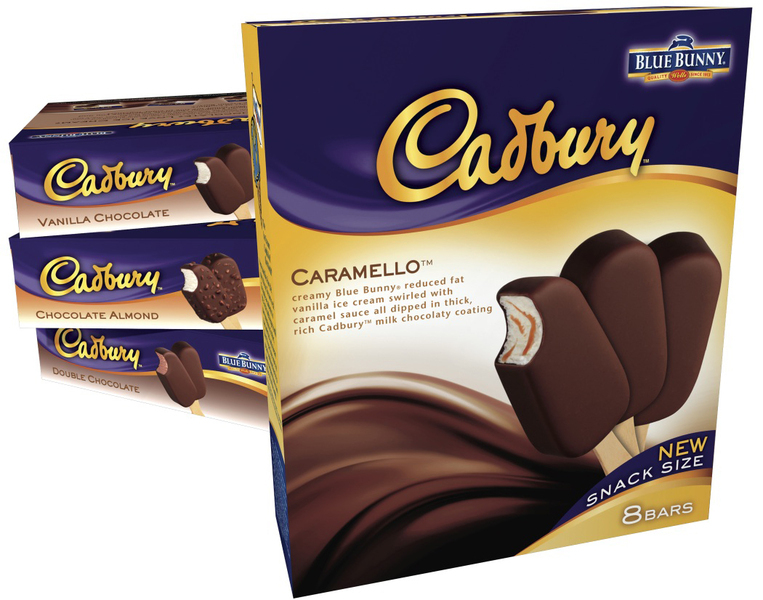 Blue Bunny® ice cream has teamed up with Cadbury® chocolate in the creation of four new premium ice cream bars. The Cadbury™ Ice Cream Bar features creamy Blue Bunny® ice cream dipped in thick, rich, Cadbury chocolaty coating. 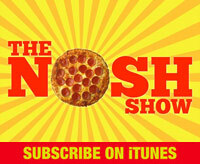 It’s snack size indulgence at a price and size the whole family can enjoy. Look for Cadbury™ Caramello™, Cadbury™ Double Chocolate (my review here), Cadbury™ Vanilla Chocolate, and Cadbury™ Chocolate Almond (Nick's review here) in the freezer aisle of your local grocery store. All six Blue Bunny® Chef Duff Goldman-inspired ice cream flavors are now available in pints! Bring the ice cream parlor experience home—-in a snack size! The new Champ!® Snack Size Ice Cream Cones, miniature versions of the Champ!® Cone, feature a chocolate-coated sugar cone filled with homemade vanilla or chocolate ice cream dipped in chocolate and topped with crunchy peanuts. This fun afternoon snack may be small in size but is sure to satisfy your hunger and craving. With both chocolate and vanilla flavors in one box everyone gets their favorite flavor! Look for these and other Blue Bunny® ice cream treats at your local grocer. Follow us on Facebook at Facebook.com/BlueBunnyIceCream and on Twitter at @Blue_Bunny. Blue Bunny®, founded in 1913, is a brand of Wells Enterprises, Inc.—the largest family-owned and managed ice cream manufacturer in the United States. Today, more than 500 Blue Bunny®-branded products, including ice cream and frozen novelties, can be found across the US. Always committed to quality, Blue Bunny® products are made with only real ice cream. Wells Enterprises, Inc. is headquartered in Le Mars, Iowa, the Ice Cream Capital of the World. Coffee cake AND carrot cake?!? (my absolute favorite cake flavor!! )This may well be the year the world's ending because this is my version of heaven! Let's hope they taste as good as they sound!